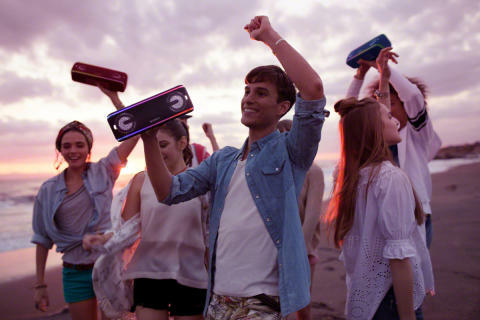 The new SRS-XB41, SRS-XB31, and SRS-XB21 EXTRA BASS™ wireless speakers from Sony are announced today - so your quest to find your perfect party speaker can end here. 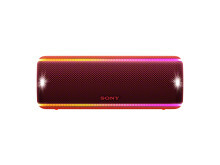 With portability, durability, EXTRA BASS™ power and LIVE SOUND mode at the forefront, Sony assures you these speakers will provide the ultimate party wherever you go. 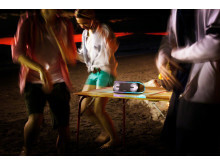 The sound quality of these speakers will completely steal the show, as they create a 3-dimensional music experience which aims to make you feel as if you are in the middle of a music festival, with singers performing directly to you. This is down to the new DSP (Digital Signal Processor) and the angled speaker that combine to provide a LIVE SOUND mode. With this mode on, you can feel the sound spreading both vertically and horizontally. 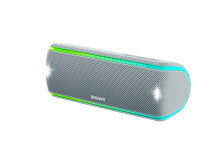 Additionally, these speakers are designed to sustain and focus on “deep bass” & “punch bass” which perfectly supports bass-heavy music such as EDM, grime and hip-hop. The new fabric material design, which comes in up to 5 colours, means the speakers are robust and washable -so the odd spillage will never be an issue. 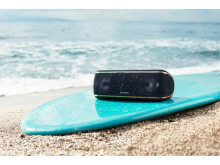 They are also waterproof and dustproof with an IP67 rating, meaning you can enjoy the speakers on the beach, at a pool party or even put them in the mud without worrying about damaging them! 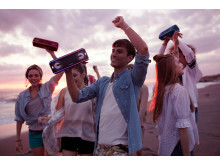 These mighty speakers are also rust-proof, so even if you accidentally drop them in the ocean they can survive. 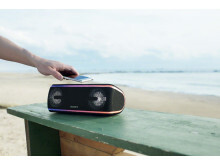 The Sony EXTRA BASS™ range has been extended with these three speakers and is better than ever, now even more outdoorsy and durable so they can battle the elements of your day-to-day life. Let the speaker be the host and entertain your mates with the new, playful ‘Party Booster’ feature. 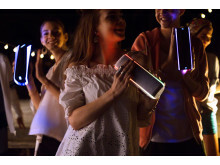 The speaker can be used like an instrument, and can detect tapping from 5 different directions thanks to a built-in accelerometer that generates a sound and lighting reaction. This creates a uniting party experience full of interactive opportunities, all you need to do is tap and enjoy! With line lights in multiple colours, and speaker and flashing strobe lighting effects, the XB41 will liven up any atmosphere by adapting to the music you love to make it feel like a festival or in your favourite club. The XB31 has a multicolour line light and a flashing strobe, while the XB21 has a single colour line light. 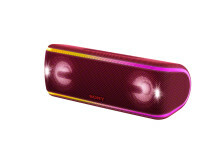 The lighting, paired with the sound features mean you can create an effortlessly great night. 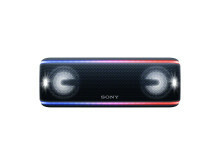 For the first time, you can now build the bass with Sony speakers by connecting up to 100 compatible (SRS-XB41/31/21) speakers together. You can fill a room or build a wall to create a vast, powerful EXTRA BASS™ sound experience and get all your friends involved. They are wireless and are designed so you can hand-carry them wherever you choose. Being so compact alongside a 24 hour battery life, you can bring EXTRA BASS™ sound anywhere and the party can carry on all night long. The SRS-XB41 model will be priced at approximately €230/£200 and available from April 2018, across Europe in black, white, dark red and dark blue. The SRS-XB31 model will be priced at approximately €170/£150 and available from April 2018, across Europe in black, white, two-tone red, two-tone blue and two-tone yellow. The SRS-XB21 model will be priced at approximately €120/£100 and available from April 2018, across Europe in black, white, red, blue and yellow.